The satellites for Arianespace’s 12th flight in 2015 – which will close out the company’s record year of launch activity – have arrived in French Guiana with delivery of the latest two European Galileo navigation platforms to be lofted by Soyuz. These spacecraft landed at Cayenne’s Félix Eboué Airport aboard a chartered freighter jetliner, and were transferred via road to the Spaceport’s S1 payload preparation facility for checkout. Scheduled for mid-December, the upcoming medium-lift Soyuz mission with its pair of Galileo satellites will conclude Arianespace’s busiest launch activity year ever involving all three members of its launcher family – which also includes the heavy-lift Ariane 5 and lightweight Vega. The December Soyuz launch is designated Flight VS13, signifying the medium-lift workhorse’s 13th mission from French Guiana since its service entry at the Spaceport in October 2011. To support the growing Galileo constellation, Soyuz is fitted with a vertical dispenser that accommodates the two navigation satellites deployed on each mission. 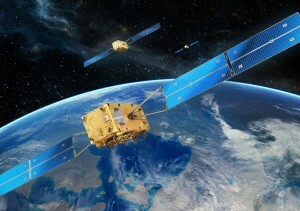 The European Commission manages and funds Galileo’s current FOC (Full Operational Capability) phase, with the European Space Agency delegated as the design and procurement agent on the Commission’s behalf. Galileo is Europe’s own global navigation satellite system, providing a highly accurate, guaranteed global positioning service under civilian control. It is interoperable with GPS and Glonass, the US and Russian global satellite navigation systems. By offering dual frequencies as standard, Galileo is set to deliver real-time positioning accuracy down to the metre range. The fully deployed Galileo system will consist of 24 operational satellites plus six in-orbit spares, positioned in three circular Medium Earth Orbit (MEO) planes at 23 222 km altitude above the Earth, and at an inclination of the orbital planes of 56 degrees to the equator. Initial services will be made available by the end of 2016. Then as the constellation is built-up beyond that, new services will be tested and made available, with system completion scheduled for 2020. For more information see: What_is_Galileo?